Read to learn more about what AI is looking like in dentistry. Today’s AI is invading our everyday lives, albeit in more subtle ways, such as digital assistants like Alexa and Siri. Now, Artificial Intelligence in dentistry has arrived! Consider a daily task that we as dentists view as routine and relatively simple: finding caries on X-rays. In fact, in doing so, we are “processing” conversations with the patient, the patient’s history, complex and nuanced radiographic images, and our direct intraoral exam. We’re also leveraging our training, which includes our dental education and having read thousands of radiographs over years in practice. Even so, it’s estimated that our misdiagnosis rate of caries from X-rays may be 20 percent or higher. For machines to perform tasks such as reading radiographs, they must be “trained” on huge data sets to recognize meaningful patterns. They must be able to understand new information in the form of spoken language, written text, or images with proper context and nuance. Finally, they must be able to make intelligent decisions regarding that new information and then learn from mistakes to improve the decision-making process. In order for an AI system to have a practical benefit in the real world, all of this must happen in about the same time that a human being can perform the same task. Until very recently, applications of AI on a broad scale weren’t technically feasible or cost-effective, so the reality of AI hasn’t yet matched the possibilities. The last five years have marked the modern era evolution of AI, which is being ushered in with tremendous hype and investment. Big data and cloud computing have provided ready access to the large data sets required to train intelligent systems. All of that data requires vast amounts of storage, which has become not only cheap but also fast in terms of data retrieval. New York Times tech author John Markoff reported on another breakthrough that came out of a 2011 project called Google Brain, which applied “deep learning” methods to the challenge of extracting meaning from 10 million YouTube videos' images. Ironically, once set free to surf the internet, Google Brain did what its human counterparts do every day — it searched for (and successfully found) cats. What’s astounding about this accomplishment is that scientists never told the machine, “This is a cat.” By using deep learning, Google Brain created an abstract construct for cats based on image recognition. Deep learning, the most cutting-edge AI technique in the broader field known as machine learning, uses layered neural networks patterned after the human brain. Traditional machine learning techniques rely on handcrafted rules defined by human domain experts and don’t improve with larger datasets. Deep learning creates its own rules that improve with additional data, making it well suited to interpret the unstructured data required for advanced applications such as self-driving cars, predicting earthquakes, disease detection, and diagnosis and treatment recommendations in medicine. 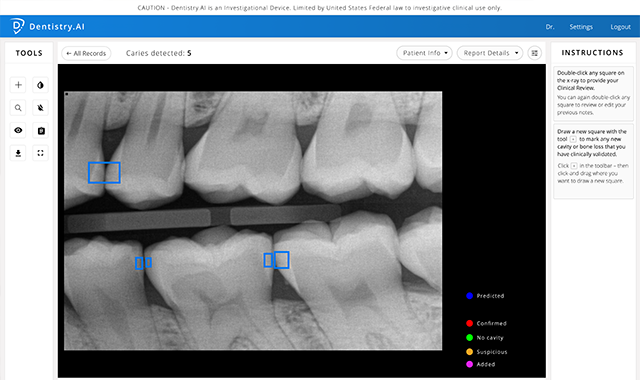 Dentists actually have access to a deep-learning AI platform for detecting caries right now. Dentistry.AI, in the late stages of clinical evaluation, allows any licensed dentist to sign up as an investigator and utilize the system. Healthcare, in general, is a very natural customer for artificial intelligence applications. After conquering the television game show “Jeopardy” in 2011, IBM’s Watson has gone on to a second career in medicine. Oncologists at New York’s Memorial Sloan Kettering Cancer Center have recently trained Watson to help fight cancer. While the program is still in the early phases, the machine already does very specific, monotonous, and time-intensive tasks extremely well. For example, Watson can read a half million medical research papers in 15 seconds and, with deep learning, can recommend diagnoses and the most promising treatment options. With the ability to analyze vast numbers of diagnostic images such as X-rays, CT scans, and MRIs, systems like this can point doctors and radiologists to the most probable areas of concern, increasing both the speed and probability of detection. 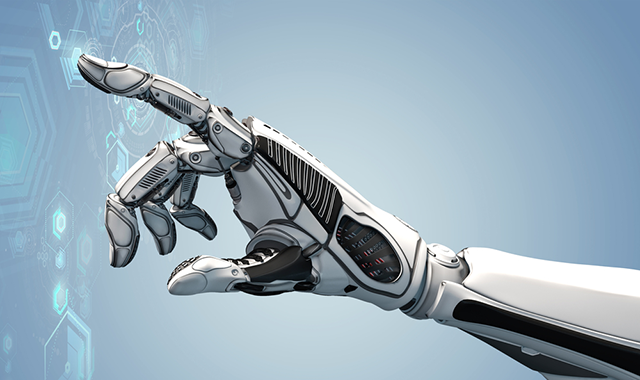 And now, with the FDA creating regulatory pathways to encourage developers of medical decision support software, analysts predict that the use of artificial intelligence in healthcare will grow tenfold in the next five years. As noted earlier, the Dentistry.AI team has a platform for caries detection that’s in the final stages of clinical evaluation. Active development began just over two years ago, and the engineers quickly learned that teaching a computer even this singular dimension of clinical dentistry isn’t easy. Yet, there has been significant progress toward a clinically relevant predictive assistant for the dental practice. In a recently published study, they presented the results of a man vs. machine caries detection challenge that pitted three practicing dentists against Dentistry.AI in evaluating 500 bitewings. The machine outperformed the dentists in “sensitivity,” which measures the proportion of caries correctly predicted when compared with total caries present in ground truth. The dentists won the day in “precision” (the ratio of correct predictions versus total predicted caries sites), although the machine was comparable to one of the three dentists in precision as well. Let’s call it a tie for now, although the system continues to learn and improve. Commercial availability of a reliable caries-detection tool based on deep learning artificial intelligence appears likely in the next 12 to 24 months. Applications for detecting periodontal disease and the bone loss that accompanies it aren’t far behind. With the continued adoption of CBCT, interpreting cone beam images is another area in which AI can boost productivity. At this point, analyzing cone beam data requires a specific level of training and expertise. This analysis can be time-consuming, involving sifting through hundreds of image slices. With AI, the entire process of interpretation can be automated to assess the image as a whole to detect dental pathologies more quickly and accurately. Clearly, the stage is set for the rapid proliferation of truly impactful applications of AI in dentistry over the next year or two. In 10 to 15 years, the use of AI-based technologies in the practice will be as commonplace and pervasive as practice management and imaging systems are today. In the very future, we foresee deep learning analysis tools for images, assisting in diagnosing, and treatment planning of periodontal disease by enabling early detection of bone loss and changes in bone density. Detection of peri-implantitis and early intervention is a likely benefit in implant dentistry. In orthodontics, more sophisticated predictive models for tooth movement will likely enhance digital treatment planning. Applying deep learning image analysis to oral cancer will lead to earlier detection and more accurate diagnoses with lifesaving implications.